Graduation Ceremony for the second cohort of the UONGOZI Institute’s Postgraduate Diploma in Leadership Programme took place on 09th April, 2019 at Milimani City Conference Centre, Dar es Salaam. The Ceremony was officiated by the Deputy Minister of State, President’s Office – Public Service Management and Good Governance (PO-PSMGG), Hon. Dr. Mary Mwanjelwa (MP). Launched in 2017, the one-year Programme aims to develop leadership competencies with a focus on Making Strategic Choices; Leading People and other Resources; and Excelling in Personal Leadership Qualities. The Programme, jointly delivered by UONGOZI Institute and Aalto University Executive Education of Finland, offers 10 modules, combining in-class workshops with online individual or group assignments. In her remarks, Deputy Minister Mwanjelwa commended graduates for their determination and commitment, which was paid off with the award of diplomas. She further commended UONGOZI Institute for mobilising the necessary resources and expertise to deliver the Programme. She explained how the Programme aligns with the Public Service Reform Programme (PSRP) that aims to improve accountability, transparency and resource management for service delivery. Furthermore, Deputy Minister noted that the PSRP, being implemented by the PO-PSMGG, requires “well-organised, skilled, ethical and dedicated public servants” in order to achieve the aims of the initiative. Prof. Semboja further stated that the Institute continues to collaborate with various stakeholders to ensure the sustainability of the Programme. “For the third cohort, we have introduced cost-sharing, and we are pleased with the positive outcome,” he expressed. 35 participants from the third cohort also attended the occasion. The cohort includes senior leaders from public, private and civil society organisations within Tanzania. The cohort commenced its first module on Reflective and Inspiration Leader on 09th April. The Deputy Minister of State, President’s Office – Public Service Management and Good Governance (PO-PSMGG), Hon. Dr. Mary Mwanjelwa (MP) delivers Keynote Address. The CEO of UONGOZI Institute, Prof. Joseph Semboja delivers opening remarks. The Group Managing Director of Aalto University Executive Education delivers his remarks. One of the Graduates, Ms. Beatrice Kimoleta receives her diploma certificate. One of the Graduates, Hon. John Mongella receives his diploma certificate. On 11th February, 2019, the Minister of Minerals, Hon. Doto Mashaka Biteko (MP) officiated a two-day Stakeholders’ Workshop to discuss the Proposed Mining (Mineral and Gem Houses) Regulations, 2019 in Mwanza. Jointly organised by UONGOZI Institute and the Ministry of Minerals, the Workshop aimed at broadening the knowledge of relevant stakeholders, and developing a common understanding on issues related to the mining sector and how best to enhance its contribution to national economic transformation. The Workshop gathered about 100 District Commissioners, Directors of Local Government Authorities, District Administrative Secretaries, and Artisanal and Small-Scale Miners from twelve regions of Tanzania, namely Dodoma, Arusha, Geita, Shinyanga, Mara, Manyara, Kagera, Tabora, Singida, Mbeya, Morogoro and Ruvuma. In his address, Minister Biteko underscored the significance of the Workshop to his Ministry and country as a whole. “The Ministry of Minerals’ main goal is to ensure that the extractive sector contributes to the social and economic growth in our country,” he stated. He went on to note the timeliness of the workshop, given the misinformation and misconceptions revolving around the mining sector. He urged participants to pay attention and contribute to the discussion to get a better-understanding on the proposed mining regulations, and subsequently share that knowledge with the public. Minister Biteko further said that Tanzania has so far managed not to become a victim of the resource curse. He said in order to remain on the same track, leaders must ensure the following; transparency in the management of mineral revenues, citizens’ participation in decision making and implementation of development plans, mineral revenues invested in sustainable projects such as infrastructure and education, and public awareness on the natural resource management value chain. On behalf of the CEO of UONGOZI Institute, Mr. Kadari Singo, Head of Executive Education stated that for about five years the Institute has been implementing programmes that aim to enhance natural resource management and local content participation in the country. “As a part of these programmes, we have offered training and technical support on natural resource management to the Government Negotiation Team and key ministries, to ensure the sector reaps substantial benefits,” he stated. The Minister of Minerals, Hon. Doto Mashaka Biteko (MP) delivering keynote address. A group photo after the Opening Ceremony with Directors of the Local Government Authorities. Participants contributing to the discussion. Dar es Salaam, 20th December 2018: UONGOZI Institute and REPOA have launched a new programme that aims to support the Government to design and implement policies to improve the economy and business environment in the country. The programme officially known as ‘Evidence – Based Policy Making on Economic Governance in Tanzania’ will be co-implemented by the two institutions during a five-year period. The announcement was made today at the Julius Nyerere International Convention Centre during a half-day workshop to identify focus areas for the programme to ensure relevance in improving economic governance in the country. The workshop gathered 50 policy, planning and research senior officials from various Government ministries, agencies and institutions, as well as the private sector. According to Prof. Semboja, the programme is customized to meet the Government’s ambitions of meeting sustained economic growth driven by economic transformation (productivity), industrialisation and trade expansion; as well as instruments for sustained economic growth, which include, trade, investment and economic governance. On his part, the Executive Director of REPOA, Dr. Donald Mmari said their collaboration signifies a stronger partnership in leveraging efforts in supporting the government towards a more dynamic approach in its industrialization journey, in particular, implementing the National Five-Year Development Plan 2016/17 – 2020/21, which carries the theme ‘Nurturing Industrialization for Economic Transformation and Human Development’. “Tanzania has enjoyed a GDP growth rate of 6.9% during the last 10 years. We therefore believe that with the kind of informed research that this programme is going to produce, the national economy will be able to grow to double-digit numbers,” said Dr. Mmari. The major focus of the programme will be designing and implementing policies that can improve macro fiscal policy in the areas of budget credibility, debt management, public expenditure management and financial accountability, and Inter-governmental fiscal relationships. Regarding business environment, the programme aims to contribute solutions on the constraints to the ease of doing business, constraints to private sector growth, and the aspect of competitiveness. During a presentation at the workshop, a Researcher from UONGOZI Institute, Dr. Godfrey Nyamrunda stated that in terms of the set of institutions, policies and factors that determine the level of productivity and competitiveness; Tanzania has scored 47.2 out of 100. The country has also been ranked 116 out of 140 economies assessed by The Global Competitiveness Index 2018. Dr. Nyamrunda said that the Programme aims to support the Government of Tanzania and other development stakeholders to address some of the challenges through a combination of research and analysis, the dissemination of research outputs and informed policy dialogue. Other key stakeholders that will play a key role in the programme include the Bank of Tanzania, University of Dar es Salaam, University of Oxford and Christ Mckillen Institute (CMI). Fifty-two Regional Commissioners (RCs) and Regional Administrative Secretaries (RASs) from Tanzania Mainland are participating in a one-week intensive leadership programme from Monday 3rd December, 2018 to Friday 7th December, 2018 in Dodoma. The leadership workshop, which has been organised by UONGOZI Institute in collaboration with the President’s Office, Regional Administration and Local Government (PO-RALG), was officiated by Hon. Kassim Majaliwa Majaliwa (MP), Prime Minister of the United Republic of Tanzania, on 03rd December, 2018. Two Ministers were in attendance, Hon. Capt. (Rt.) George Huruma Mkuchika (MP), Minister of State, President’s Office, Public Service Management and Good Governance; and Hon. Selemani Said Jafo (MP), Minister of State, PO-RALG. In his address, Prime Minister Majaliwa urged the RCs and RASs to use the Programme as an opportunity to strengthen their leadership capacities and competencies. The Prime Minister instructed the RCs and RASs to implement the following upon their return to respective Regions; increase efficiency, ensure work plans are developed and implemented, maintain peace and harmony in respective areas, organise meetings to discuss legal issues, address land disputes (including farmer-herder disputes), manage farmers’ associations to ensure farmers reap the benefits, manage public resources and consider value for money when implementing development projects, manage risks and internal control systems, ensure availability of social services, ensure regular school attendance as well as the protection and welfare of female-students, and to follow instructions from their seniors. On his part, Prof. Joseph Semboja, CEO of UONGOZI Institute underscored the objective of the Pro0gramme. “Experience and lessons across the world have shown that for a country to achieve sustainable development, good leadership must be in place,” he stated. Prof. Semboja further stated that the Programme will focus on three key leadership competencies, namely Making Strategic Choices and Decisions, Leading People and Managing other Resources, and Exceling in Personal Leadership Qualities. Prof. Semboja added that the workshop is a continuation of a collaborative initiative between UONGOZI Institute and the PO-RALG, which intends to reach as many Regional Administration and Local Government leaders as possible to strengthen their leadership competencies and increase efficiency. Similar leadership development programmes were organised for District Commissioners and Directors of Local Government Authorities, and delivered in five phases between May, 2017 and October, 2018. The five-day workshop will cover several key topics, including Personal Leadership and Emotional Intelligence, Harmonious Political-Administrative Interface, Strategic Communication, Protocols and Etiquettes, National Defense and Security matters, Management of Public Finances and other Resources, Procurement in the Public Sector and the Control of Illegal Drugs. Former leaders of the public sector and political parties, as well as current leaders from the public and private sectors, civil society and academia gathered at the Julius Nyerere International Convention Centre on Friday 02nd November, 2018 to deliberate on leadership development approaches under the theme “Promoting Leadership Development in Tanzania”. Organised by UONGOZI Institute, the high level dialogue aimed at reviewing leadership development approaches in Tanzania; sharing insights, knowledge and experiences on the subject; and discussing current initiatives and their adequacy in developing the desired leadership cadre in the country. The opening address was delivered by Prof. Penina Mlama, Member of the UONGOZI Institute’s Board of Directors on behalf of the Minister of State, President’s Office, Public Service and Good Governance, Hon. George Mkuchika (MP). In his speech, Minister Mkuchika highlighted that good leadership is at the foundation for sustainable development in any society or nation in the world. He further underscored that in Tanzania, leadership development began before the country’s independence (1961), and to date, both informal and formal approaches have been applied, including the establishment of UONGOZI Institute in 2010 with the aim of building the capacity of leaders for the sustainable development of their citizens. Minister Mkuchika further stated that his expectation was for the dialogue to raise important issues that will assist the Government in developing leaders who are capable of leading the Tanzania of today and the future. On his part, the CEO of UONGOZI Institute, Prof. Joseph Semboja emphasised that the dialogue aims to find the best leadership development approaches for the country’s transformation and not to assess the previous or current leadership. Prof. Semboja further stated that history has shown that countries with leaders who have a compelling vision and ability to lead their people towards its realisation have experienced rapid economic growth. The dialogue was moderated by Prof. Issa Shivji, a renowned law and development scholar. Other panelists and participants included Hon. Anne Makinda, former Speaker of the National Assembly of Tanzania; IGP (Retired) Said Mwema; Amb. Ombeni Sefue, former Chief Secretary of the United Republic of Tanzania; Amb. Dr. Matern Lumbanga, former Chief Secretary of the United Republic of Tanzania; and Hon. Zakia Meghji, former Minister of Finance. 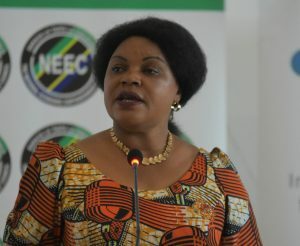 UONGOZI Institute and the National Economic Empowerment Council (NEEC) jointly organised a one-day Local Content Stakeholders’ Workshop, which took place on 16th October, 2018, in Dodoma. The workshop, which was officially opened by The Minister of State in the Prime Minister’s Office, Policy, Parliamentary Affairs, Labour, Employment, Youth and the Disabled, Hon. Jenista Joakim Mhagama (MP), discussed and validated the proposed “National Multi-Sector Local Content Guidelines”. Representatives from the public sector, private sector, academia and civil society were in attendance. Delivering introductory remarks, Mrs. Beng’i Issa, Executive Secretary of the NEEC said the Guidelines were developed to ensure implementation of economic empowerment initiatives. Mrs. Issa further stated that currently, there are fifty-seven local content coordinators in each Ministry and some Government institutions, charged with the responsibility of ensuring citizens’ participation in investment projects. On behalf of the CEO of UONGOZI Institute, Mr. Kadari Singo, Head of Executive Education said research shows that local content and participation are critical for the profitability and sustainability of investment projects, and further elaborated on how the Institute’s programmes contribute to the acceleration of the two. In her address, Minister Mhagama stressed that Tanzania’s fifth-phase Government has set a target of ensuring Tanzania becomes a middle-income country by 2025, through implementation of strategic projects. Hon. Jenista Joakim Mhagama (MP) delivering Opening Address. Minister Mhagama underlined that the Government intends to put the Guidelines into practice before the end of this year, and directed all local content coordinators to follow and report on them accordingly. Minister Mhagama further emphasized the importance of cooperation among stakeholders for increased local participation and economic empowerment, and closed with a Swahili proverb; Kidole kimoja hakivunji chawa (a single finger does not break a louse). In recent years, there has been a growing appreciation that business (and the private sector more generally) can and should have a greater role to play in a society’s well-being and progress. The traditional view that “the only thing that matters is the bottom line” ultimately still applies, however there is a growing appreciation regarding just how that bottom line is met. As a result, economic activities and organisations can no longer be viewed as separable from broader society. Globally has been most evident in concerns regarding environmental protection and abusive labour practices. These concerns have been on the rise since the 1970s and are increasingly part of our thinking around fairness and equality. One example of this is the growth of CSR – Corporate Social Responsibility. Ostensibly, this concept treats a business or company as a ‘citizen’, complete with responsibilities to the community within-which it operates. This has ranged from charitable donations, to ‘community days’ among others. However, to truly mobilise the skills and competencies contained within the private sphere, more needs to be done. One approach that has been adopted in some parts of the world is to make social and charitable contributions tax deductible. Embracing this could be vital in supporting, not only socio-welfare initiatives (ranging from scholarships and volunteer programmes to the provision of medical support), but may also be used to support research institutions, the arts (theatre, music, crafts-men and -women, painters, dance, etc. ), museums, etc., that form part of the richness of a society. The range of possibilities can only be viewed as a win-win for all stakeholders. The growing interaction can lead to new business ideas, to skills transfer, to increased awareness of broader issues and concerns beyond the silos within-which people find themselves in. In addition, by enabling the private sector to choose how and where its contributions go, we encourage a sense of community based on solidarity (charitable contributions) by unlocking private generosity, rather than just on government obligation (taxes). Social-welfare projects, social enterprises, charities, and other non-profit organisations register with the government and are vetted for their social impact potential, and alignment with government policy objectives. A private organisation will provide contributions to an approved charity and file the same amount with the government revenue or taxation authority. Following inspection and verification, this amount is deducted from the taxes owed to the government revenue or taxation authority. This cannot and should not replace government-managed initiatives (which in turn could also be listed as eligible options for tax-deductible contributions). Rather, this should be viewed as complimentary to the broader societal aspirations entrusted to government. In the framework outlined above, all major actors (civil society, private, and public sectors) are involved, which prevents the rise of ‘philanthropists-as-kings’ and created parallel governance structures. The approach encourages creative problem solving to social needs on the part of the communities themselves. This in turn tends to lead to more localised or sector-specific solutions. Some of these solutions are highly experimental, which discourages public financing due to a high risk of failure. Another benefit to government is that the burden for identifying and monitoring interventions is lessened, while the choice of organisations that are supported through this mechanism provides signals about what is both appreciated, and where interventions are yielding results. For this to work, not only would a change in policy to allow tax-deductible contributions be required but also regulation of the sector, and mechanisms for registering and vetting eligible non-profit organisations. Tax and revenue authorities would need to coordinate with authorities responsible for regulating the non-profit sector, as well as with regional authorities and local governments to follow-up on the effective use of contributions. The administration involved should be streamlined and kept simple to avoid rendering this route unfeasible because of an over-burdening bureaucracy. As African businesses are beginning to really spread their wings and take off, perhaps it is time for how we in Africa relate to the private sector, and how we incorporate them into our development visions and aspirations. There is already a growing number of home-grown philanthropists treading new grounds, but these are few and far between – by permitting tax deductible contributions, all Africans (and African businesses) can better contribute to our collective welfare and transformation. UONGOZI Institute and the President’s Office, Regional Administration and Local Government’s five-day Leadership Programme for the newly appointed District Commissioners (DCs) and Directors of Local Government Authorities concluded on Friday 12th October, 2018. The closing ceremony was officiated by the Minister of State in the President’s Office, Regional Administration and Local Government, Hon. Selemani Said Jafo (MP). The programme covered nine leadership modules, including Leadership vs Management, Personal Leadership and Emotional Intelligence, Harmonious Political Administrative Interface, Structure of the Government, Peace and Security, Protocol and Etiquettes, Risk Management and Internal Control, Control of Illegal Substances/Drugs, and Effective Management of Public Resources. In his address, Minister Jafo stated that the programme serves as a leadership induction for the newly DCs and Directors of Local Government Authorities. Minister Jafo further advised DCs and Directors of Local Government Authorities to ensure they put the knowledge gained through the programme into practice. Speaking on behalf of the CEO, Mr. Kadari Singo, Head of Executive Education at UONGOZI Institute said the programme was designed to equip DCs and District Commissioners with tools and perspectives to make well-considered strategic decisions and lead transformation. Mr. Singo futher noted that the programme was the fifth leadership workshop of its kind organised for DCs and Directors of Local Government Authorities. He said that in the past, similar workshops were organised between 2017 and early 2018, where the majority of DCs and Directors of Local Government Authorities in the country participated. Hon. Selemani Said Jafo (MP) during his address. Eng. Mussa Iyombe, Permanent Secretary, President’s Office, Regional Administration and Local Government speaking during the Closing Ceremony. Mr. Kadari Singo, Head of Executive Education Department at UONGOZI Institute delivers welcoming remarks on behalf of the CEO. District Commissioners and Directors of Local Government Authorities following a presentation on Control of Illegal Substances/Drugs.